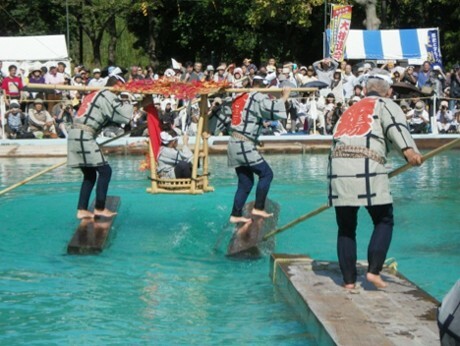 Kakunori is the traditional act of “riding” blocks of wood. The area’s name Kiba (“ki”, meaning wood, and “ba”, meaning place) derives from its historical role for storing wood. Lumber dealers during the Edo period navigated blocks of timber for rafts and buildings down the river, using only a stick and their bare four limbs. Over time, these lumberjack-acrobatics gradually developed into a form of art, and is now performed once a year during October. Watch as kakunori (woodblock riders) tiptoe across large blocks of wood blindfolded, upside-down, with children on their shoulders, on ladders, and countless other unbelievable ways. Here’s a video of the event from 2011.